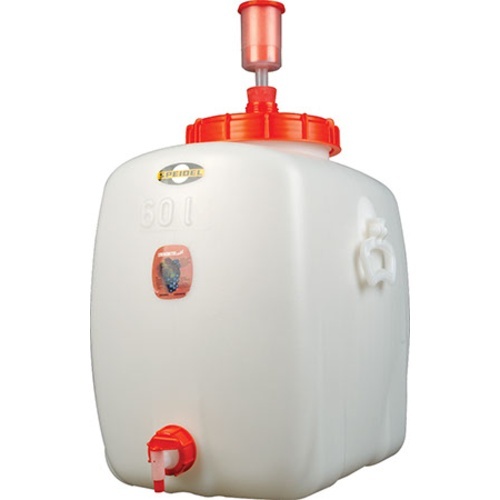 These rectangular, heavy duty plastic tanks offer a fantastic fermentation & storage solution at a great price. Designed and manufactured in Germany by Speidel, the makers of our legendary commercial wine tanks. I feel the square shape will fit better in my refrigerator fermenting chamber. It is the right size for us to transport and store our concentrate in. I want to compare results with the Kegmenter fermentation keg. Already own one and speidel fermenters are sturdy and easy to use. repeat purchase, they work very well! Own some and like them. Speidel makes a great product, and Iâ€™m increasing production. i think it will be a cleaner process. Can someone please confirm the exterior dimensions as 22"L x 16"W x 22" H for this 60 L rectangular version? It seems this works out to be much larger than 60 L. I've got limited space and need to know the exact measurements before purchasing. The measurements are correct and they hold close to 16 gal. when filled to the top. We have several of these and love them. I would suggest getting a small dolly to put them on as they are very heavy when full and with a dolly under them you can move them around. I have barrel, flextanks and spiedels. This is the best overall design; twist on cap and shape lends itself for cleaning and storing wine. easy to order, arrived quickly and my husband was amazed at the quality. Love it. But plastic spout leaks; so I just fixed this issue by purchasing a new solid cap and drilling it out and adding a brew tech stainless steel. Just makes life easier for a little guy like me! Well made but I wish it came with a thermowell. I use it to store mi RO/ DI water after treatment and before brewing. 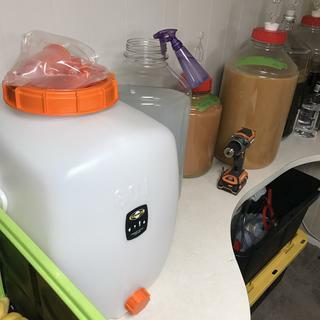 The tank is well built and comes with everything you need to ferment, if that is what you are using it for. I would but this over the big mouth bubbler. Used it three times now and it's a great product. Definitely recommend. I find that MoreBeer is a good company to deal with too. Great quality! This an excellent product, it was constructed of high quality components and cleans up so easily. It is is the equivalent of going from cast iro to Teflon cookware. No staining or smells to carry-over from batch to batch. Speidel 15 gallon is perfect! This product not only was delivered promptly but is an awesome fermenting vessel. It is easy to handle empty or full (because of the strong handles on the sides). Made of top quality material!! We've used all 6 that we ordered and plan to order more!! Thank you!! amazing with 10g batches. 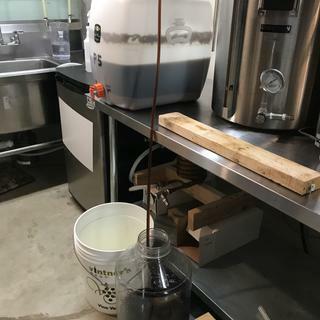 No need for blow off, easy transfer to secondary/keg/bottle. Wide mouth and removable parts make it extremely easy to clean. I mostly use stainless, but this is an excellent fermenter in the plastic line. I chose the square one which fits nicely in my antique refrigerator for controlled temperature fermenting and lagering. You might want to upgrade the spout to the one that will get closer to the bottom when draining, but I gently tilt and that works fine. I modified my top to accept a standard S bubbler with just a proper sized drilled stopper. Easy to clean. 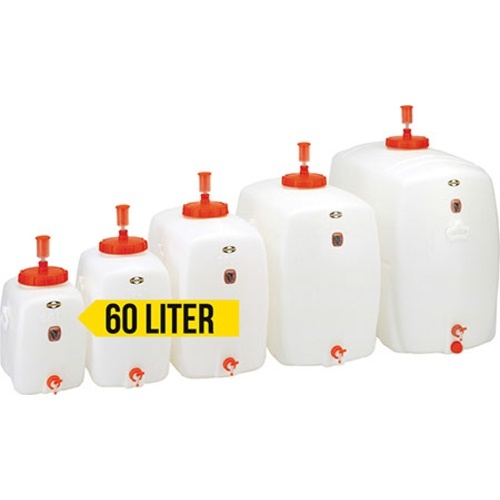 I prefer 10 gallon batches over 5 so this is a great size for that. Does not appear to have a good seal on large lid. Gassed head space with CO2, but unlike barrels and glass carboy, no vacuum resulted. Called MoreFlavor about the lid, asking if I was missing an o-ring, and someone said they'd investigate and get back to me. Nobody called me back. As far as I know, I'm oxidizing the wine right now. Gave it 3 stars because it is strong, compact, and otherwise well made.